As well as our unique mix of news and views on The Mag website, we are always on the look out for quality to bring you in other areas. I love new ideas and something a bit different to get people for birthdays/Christmas, when I discovered TyneTshirts.com I knew I was onto a winner. We have now linked up with them to bring you a special 15% off discount offer (enter MAGTYNE15 when you get to checkout) but hurry, it ends this Sunday. They have a massive range to choose from but my personal favourite is their ‘Geordie Republic’ one. Thanks to state of the art equipment every t-shirt is individually printed which allows you to add your own personal touch at no extra cost! 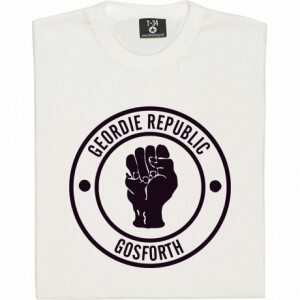 The classic Northern Soul clenched fist of the 60s is given a Geordie twist and as well as the wording ‘Geordie Republic’ at the top you then choose whichever district of Tyneside you want to add – Gosforth, Byker, Gateshead, whatever. Even better you have the freedom to add anywhere else you fancy, so whether you are exiled in Tokyo or Slough, you can add your own unique slant. The t-shirts are top quality and retail at only £14.99 but if you get in quick by Sunday you will get 15% off, bringing them down to an even more bargain busting £12.74! Simply enter MAGTYNE15 when you get to the checkout.